Eunectes notaeus Cope 1862: 70. Type Locality: Paraguay River and confluents. Holotype: USNM 4707. Distribution and Habitat: The Yellow Anaconda ranges from about 15°S in Bolivia and Brazil to 32°S in Argentina. It inhabits wetlands, including; swamps, seasonal floodplains, palm savanna, marshes, gallery forests, and oxbow lakes. In Argentina, it is restricted to the northeast portion of the country in the states of Corrientes, Chaco, Entre Rios, Formosa, Misiones, and Santa Fe. In Bolivia, it occurs in the northeast border region with Brazil. Here it is sympatric with Eunectes murinus. 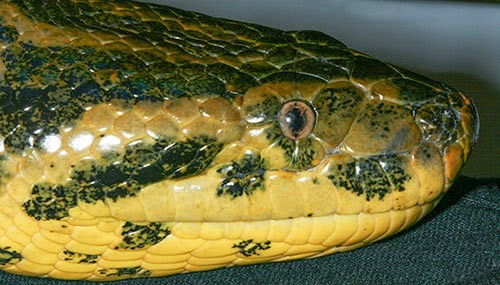 In Brazil, the Yellow Anaconda inhabits the western Pantanal in the states of Mato Grosso and Mato Grosso do Sul. There is an outlying, isolated, population in São Paulo Province. In Paraguay, the species is widespread, inhabiting the Paraguay, Parana, and Pilcomayo River Basins, In Uruguay it is known from only one specimen from Achaval Province. The specimen may have been the result of waif dispersal from flooding on the Cuareim River. Diet: Prey items were collected from 49 males and 37 females by Waller et al. (2007). They found all vertebrate classes represented. Rodents were eaten most often (67%) by both sexes. The largest female examined was 3.1 m and contained hairs from a Capybara. The most common prey was the Water Rat (Holochilus chacarius). Birds were taken from nine snakes, and included cormorants, limpkins and wading species. Three of the Anacondas had eaten the dipsidid snake known as the False Water Cobra (Hydrodynastes gigas). Waller and colleagues report that feeding is risking for the Yellow Anaconda, because they found large prey can inflict mechanical damage as they pass through the digestive system. 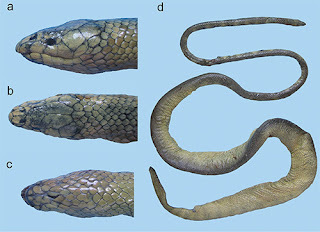 A stingray spine had perforated the esophagus of one female, a bird leg had punctured the intestine of another snake, and two anacondas contained large spines from a shrub.